Cambridge’s scientific community saw many landmark events in 2018. Thea Elvin, Marco Oechsner and Zak Lakota-Baldwin share some of the most notable moments and developments of the past year. In March 2018, Cambridge made international headlines following the death of arguably its most famous alumnus. Professor Stephen Hawking, famed for his work on black holes and the discovery of Hawking radiation, passed away at the age of 76. The month after his death his final paper, “A Smooth Exit from Eternal Inflation?”, was published in the Journal of High Energy Physics, and deals with the idea of the multiverse. Eternal inflation, in which inflation caused by the Big Bang is hypothesized to carry on forever, leads to the idea of an infinite number of universes. These universes form in patches where this inflating space slows down and should be able to form in infinite numbers, however these infinite quantities cause mathematical problems. Hawking’s highly theoretical final paper proposes ways in which boundaries on these infinite universes could be defined, paving the way for future work in the area - a fitting legacy for the acclaimed theoretical physicist. A significant breakthrough came from a group of Cambridge scientists in the form of the world's first artificial placenta. This 3D "organoid", derived from the placental cells of aborted foetuses, gives researchers a tool with which to study developmental abnormalities and complications during pregnancy. Miscarriages or pre-eclampsia have remained medical mysteries, as scientists were limited by the lack of an adequate experimental model. Though only a millimetre in diameter, this mini-placenta acts as a suitable stand-in, producing proteins that give a positive result on a pregnancy test. It can therefore be used to further investigate the interactions between the various maternal and foetal cells. It is hoped that this study will lay the foundations for further understanding and progress towards preventing complications in pregnancy. Professor Zernicka-Goetz made waves in 2016 when her group was able to grow human embryos in vitro for up to 13 days (nearly double what was possible before). In 2018, they built on this major breakthrough, by creating murine embryo-like structures from embryonic and extra-embryonic stem cells. 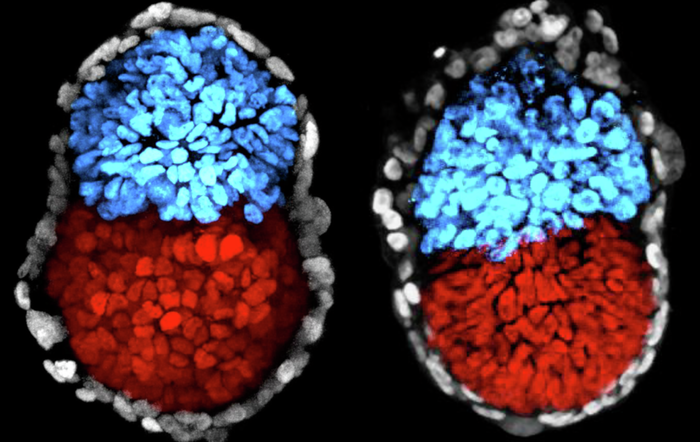 For the first time, the necessary environment for the embryo to develop is formed by the extra-embryonic stem cells in culture, not requiring any other scaffolding to achieve the assembly of these cells into an artificial embryo capable of gastrulation. This will allow her group, and other scientists, to investigate the crucial early events in the development of the embryo, what has long been thought of as a ‘black box’. Professor Zernicka-Goetz came to Cambridge in 1995 as a postdoc in Prof. Martin Evan’s group, and has been leading her own research group since 1997. Professor Klenerman is probably best known for developing next-generation sequencing (NGS) together with Prof. Shankar Balasubramanian, for which they were awarded a Royal Medal this year. They follow in the footsteps of the great legacy Cambridge has in genetics research. By using fluorescent labeling of nucleotides, Klenerman and Balasubramanian were able to develop a method allowing rapid sequencing of the whole genome, and has been extended into such applications as RNA-Seq, Ribo-Seq, and single-cell sequencing, now laboratory staples. They both founded Solexa in 1998, a company which was then acquired by Illumina in 2007, the major provider of NGS equipment. For this work he has been honoured as a Knight Bachelor in the 2019 New Year Honours for “services to Science and the Development of High Speed DNA Sequencing Technology.” Previously, he was elected a Fellow of the Royal Society in 2012, and a Fellow of the Academy of Medical Sciences in 2015. Professor Klenerman was an undergraduate at Christ’s, and earned his PhD in chemistry at Churchill. Recognition for another Cambridge alumnus came in the form of the Nobel Prize in Chemistry, which was awarded to Sir Greg Winter in October. The current master of Trinity College was awarded the prize for his pioneering work in directed evolution of antibodies. Winter’s research is centred around using protein engineering techniques similar to the process of natural selection. “Phage display” uses viruses like fish hooks to select antibodies attached to target proteins, in an iterative process that eventually evolves antibodies adept at tackling a certain disease. This led to the production of the first pharmaceutical product based on antibodies, adalimumab (trade name Humira), which was initially used to treat arthritis. Using a directed evolution approach, a new generation of pharmaceuticals is being produced with hopes that one day they might be able to help cure diseases such as Alzheimer’s. August 2018 saw some ups and downs in quick succession for Cambridge Professor of Mathematics Caucher Birkar, who received a Fields Medal at the International Congress of Mathematicians for his contributions to algebraic geometry, only to have it stolen less than an hour later. Fortunately, a replacement was arranged shortly afterwards, bringing the story to a happy conclusion. The Fields Medal is the most prestigious honour in mathematics, equivalent to a Nobel Prize in terms of standing. Birkar, who came to the UK as a refugee from the Kurdistan Province of Iran two decades ago, noted in his acceptance speech how unlikely a place his war-torn homeland was for a young person to develop an interest in mathematics. Of his Kurdish compatriots, he said "I'm hoping this news will put a smile on the faces of those 40 million people".